Why is it I love girl singers so much? Maybe it's the fact that my mother was one. I'd ask my analyst, if I had one. Freud aside, let's see what scrumptious all-female delights Messrs Broven, Churchill & Finnis (the Ace selection panel) have in store for us on the latest collection of Early Girls. Jazz divas, pop queens and some schoolgirls named after their own hairdos (no, not the Poni-tails!) - and that's just for starters. Mmm, looks like girl pop aficionados like myself are in for another treat. Patti Page was surely the Madonna of her day. One wonders if the hip clubbers who raved to Groove Armada's On The Beach last year realized they were chilling to the Singing Rage's 1957 classic Old Cape Cod in disguise. Here's the Ibiza crowd's chance to 'sample' the original. Patti's fans will no doubt also appreciate the inclusion of delicious tracks by multi-tracked former big band singer Margie Rayburn, Philly teenagers Jodie Sands, breathy-voiced 1960s TV starlet Shelley Fabares and mysterious Hollywood folkie Shelby Flint whose delicate offerings are scattered like cherries throughout this cake of a compilation. Those with a taste for nuttier R&B might prefer the selections by Della Reese (dig that diction! ), Stax legend Carla Thomas, Esther Phillips (reborn as a country singer), Etta James (ditto as an interpreter of standards), cool jazz icon Etta Jones, white soul goddess Timi Yuro and Faye 'Atomic' Adams whose rousing original of the perennial Shake A Hand must surely be the definitive version. Talking of rousing, blonde bombshell Lillian Briggs out-swings Louis Jordan on her attack on his I Want You To Be My Baby. This is the version Alan Freed fan Ellie Greenwich thrilled to back in 1955 and helped inspire her to write her own songs. Thanks, Lillian. 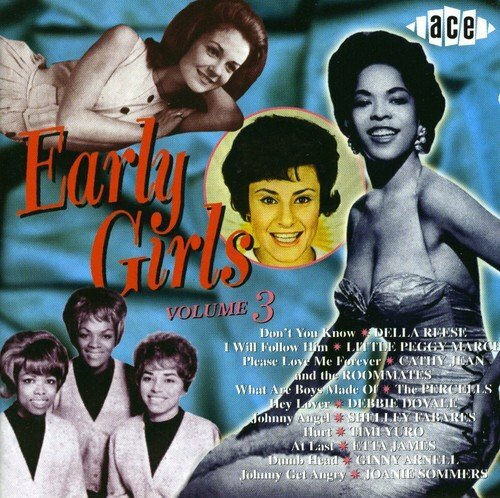 Among the poppier lovelies representing early 1960s solo girls are Joanie Sommers (the voice of a zillion Pepsi Cola jingles), beach bunny Diane Ray, Suzie Clark (whose PJ Proby-composed Ain't Gonna Kiss Ya is the only non-chart track on this CD) plus Connie wannabes like Ginnie Arnell, Bernadette Carroll and Little Peggy March, the youngest female ever to top the Hot 100. But speaking on behalf, if I may, of all femme pop devotees out there in punterland, the icing on this irresistible confection has to be the inclusion of a handful of desirable girl group-style gems. Where else can you find the Percells' What Are Boys Made Of, the Starlets' Better Tell Him No and He's Mine by the incredibly monikered Alice Wonder Land (a singing maid, no less - eat your heart out, Little Eva). Nowhere that's where. What a coup! Spanning the years 1953 to 1964, this varied compilation sounds as lovely as the deluxe packaging looks. The booklet is simply to die for. It is, as they say, exactly what it states on the tin - 28 female classics from the Golden Age of American Pop. Buy with confidence. Casey Kasem: Top Ten - 60s Motown's G.H.